With all the changes we’ve made around here to our diets – breakfast is the hardest meal of the day. I am NOT a morning person so the thought of cooking first thing makes me lose my marbles. I was always the type to grab something in a drive through or have a bowl of cereal or just nothing at all. Well those days are behind me and I have vowed to begin my day with protein and veggies! This dish is beautiful because even though it’s made on the stove top – it’s not really like cooking. It’s more like layering….. with heat. You put everything in your pan and walk away to get the kids dressed or to pack a lunch or wrap a ponytail and when you go back to it it’s ready to stuff into your face. I mean, it’s as simple as simple can be for breakfast and that’s good. Right? Choose a non-stick frying pan about 6-8 inches in diameter with a fitted lid. Lay your ingredients into the pan in the order listed above. Ham, spinach, salsa, eggs, cheese. Put the lid on and turn the burner to med-low heat. Walk away. I usually let mine cook about 8-10 min and that gives me firm yolks. Cook yours until your eggs reach desired texture. Enjoy! It’s so simple I make it at least twice a week and I can get it done and eaten while my daughter gets ready for school. If you don’t like prosciutto (what’s wrong with you? Kidding….) you can use any ham. I even made it once with sliced deli turkey and it worked well. If you like it hot, throw on some hot sauce. There’s no more sugary, nutritionally void breakfasts here. 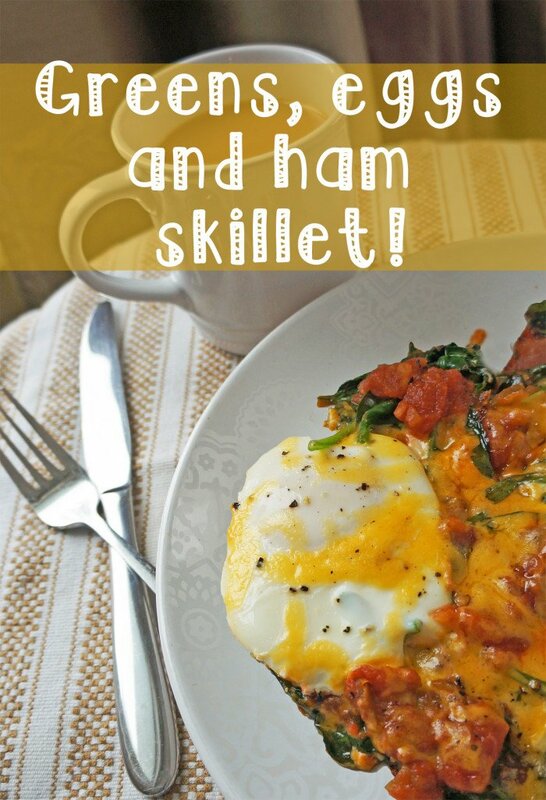 Just Greens, Eggs and Ham skillet! Gonna try this. We like our breakfasts here. Prosciutto doesn’t last long enough to crisp up around here. I love starting my day with a slice of whole wheat toast, 3 slices of cheese, a piece of peameal (or prosciutto!) with a fried egg on top! I love the addition of the spinach to get in some extra greens. Yum!